Welcome the Year of the Horse 2014! There is still a bit of the excitement from the Chinese New Year celebration a few days ago, ushering in the powerful and dynamically charging Wood Horse! The Wood Horse is anticipated to bring in lots of aggressive energy, momentum and vitality to everyone in 2014. The year of the bronco is always one of fun and frantic movement, so expect to be busy and bucking forward in your slowest moving projects. This year of the Horse is ideal for doing what you have always wanted to do but were afraid to. You'll be surprised to have the courage and ingenuity to pursue your dreams for this is the year that will make them all happen! In China, the horse is a very meaningful reminder of passion and progress. It is also a powerful symbol of the country's prosperity and promising future. The Horse has given us an indelible image of freedom, perseverance and pursuit, not only in China, but the world over. The Horse is the seventh sign of the Chinese zodiac. Its element is fire, and it is a strong yang creature. The Horse is associated with high noon and midsummer, when yang energy is at its highest. Red is the main color for the Horse, although it may also be enhanced by the colors brown, purple, yellow and sky blue. The Horse's energy is subdued by the colors white, dark blue and gold. Its lucky trees are white birch and cedar, and its most favorable direction is south, and sometimes southwest. Those born in the year of the Horse are invigorated by the scents of the jasmine and the rose. Calla lily, marigold and narcissus also vibrate with them. Horse people are protected by the semiprecious stones topaz and moonstone. Lucky numbers for the Horse are 2, 3, 7 and 8; not so lucky are 1 and 5. Great friends with fellow motivators Tiger and Dog, and goes along well with Goat too. People born in the year of the Horse abhor the company of Rat, Rabbit and Ox. In Asia, the year of the Horse is a most awaited year to kick-start important projects. They say that those born in this year cannot help but play an active role in their communities, and their schedules are often hectic. Horse people make fine, persuasive leaders who are firm in their sense of justice and are not easily won over by clever arguments. A Horse person is marked by his or her loyalty to family and friends, sticking with them for a lifetime. People born in the year of the Horse are expected to be elegant in looks and clothes, like the Horse that appears noble and fabulous in any pose. They are vivacious and idealistic, attracting people effortlessly with their inspiring talk and outstanding skills. They also enjoy popularity and good company wherever they are: in school, at work, even in the family. Let the Year of the Horse give you a head start on your wildest dreams! What's It Like Being a Horse? People born in the year of the Horse are some of the most ambitious among the zodiac animals. They like to daydream too, which can take up most of their time if they are not mindful. Their child-like happiness is infectious, and their humor is fascinating. Horse-born people love to travel and abhor being stuck in one place for long. They are intense, restless and emotional, and crave the pleasure that can be had from the pettiest thrills. Although outwardly confident, innovative and happy, Horses harbor a great fear: failure. They secretly doubt their abilities and decisions regarding work, love or life. To mask their insecurities, the Horse will start a new project or shift careers, feigning boredom over his or her last one. Although it is most noble and diligent, it is well-known in Asia that Horse people have a mild streak of arrogance along with its cheerful and well-meaning facade. The last thing they would do is ask other people for help. Fiery Horses are easily amused, and get bored just as quickly. They also like to be sincerely praised from time to time. There is the popular expression, Yi Ma, which translates to "horse of the will," referring to the traits of inconstancy and stubborn willfulness. A horse also symbolizes both small and major obsessions. Perhaps it comes from observing a horse whose hoof is suddenly plugged with a small stone. It will go crazy, kicking about relentlessly until it gets the stone off its hoof. They say that individuals born in the year of the Horse are quick to get rid of a source of irritation. They revel in solving mysteries and interesting problems, never budging until they are solved. The Chinese see the Horse as an image of continuous innovation. It also signifies the Chinese people's drive to always be better and constantly increase their capabilities. The Horse symbolizes masculine and physical power. It also stands for happiness, teamwork and an ideal social life. But not everything about the Horse is positive. Based on old Chinese beliefs, it is very unlucky to give birth to a girl in the year of the Horse. The filly or Horse girl, usually very strong and defiant, will be unlucky in love no matter how pretty she is, as no man will want to marry her. But there is hope in finding a match with men who are also born in the year of the Horse, although even then the marriage might come close to being a nightmare, since both will try to dominate the other. Unluckiest of girls (in terms of marriage) are those born in the year of the Fire Horse, for these girls will effortlessly frighten away the men. They simply dominated marriage, society and family far too often! The Fire Horse, whether female or male, was also sure to bring controversy and intrigue into the family and close social circles, and so Asians are traditionally very wary of this extraordinary individual. They say that the Horse is related to the immortal dragons of the sea. It is gifted with the power to see spirits, ghosts and treachery, seeing danger in a seemingly safe path and rebelling against a rider whom it senses as wicked. Thus in practically all cultures, the horse is the ultimate companion of the hero in magical quests and reckless adventures. The horses of China were brought in from what is now Afghanistan by ancient Chinese conquerors. 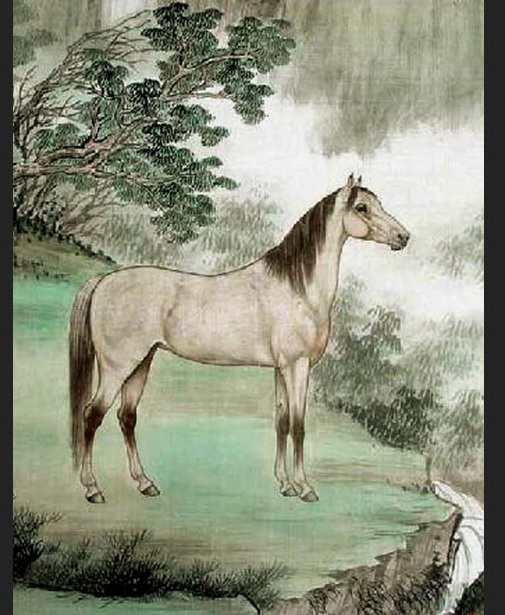 Emperor Xuanzong's heavenly horses were believed to have been born in water, thus their relations to the dragon. These horses were capable of granting immortality on anyone on earth, whereas the dragons bestow immortality while on air. An old tale goes that Emperor Fu Hsi discovered a long-ma, a dragon-horse or dragon-serpent, near the Yellow River. He envisioned it as the symbol for creativity and spirit. 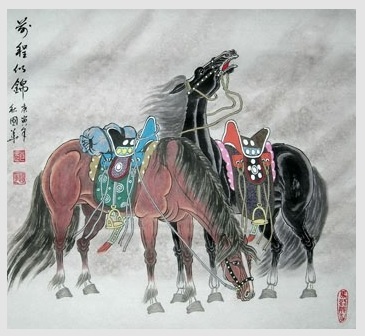 Some Chinese wind gods have been depicted as riding horses. The long-ma was also credited with presenting the Ho-tu, a magical river map, to China's legendary hero and king, Yu the Great. The horse-serpent has a long, shiny dragon-like body with the magnificent head of a horse. There are ancient poems that described a horse resembling a tiger with double spines, able to transform into a hideous monster as it galloped in the sky! In the I Ching, the male and female are represented by the dragon and the horse, respectively. This important Taoist book also described the horse as strong and swift. In later stories, the horse evolved to embody the Yang or male, and the cow took its place in symbolizing the Yin or female. People born in the year of the Horse are said to be strongest at midday. The Horse is in fact a symbol of midsummer and midday, the time of greatest Yang energy. If you are a Horse person, you are under the seventh earthly branch signifying the month of June, or the 5th lunar month. June is also reigned by western zodiac Gemini. The Horse-born is lucky during the years of the Tiger, Sheep and the Dog. Lucky Horse days are the 6th of July and the 5th day of October, while the lucky Horse months are February, July and October, or the first, sixth and ninth lunar months. Horse people should beware of the 11th day of the 11th lunar month, a time when bad news and bad luck are easy to come by. The Horse is generally in a bad mood and bad luck during the year of the Rat. The horse carries the life-changing vibrations of triumph, positive force, momentum and fame. Feng shui followers make room for a horse figurine or painting in the north portion of a room or house. This will invite better career opportunities for the employed, or more business for the entrepreneur. If you are born in the year of the Horse, you almost always have no problem, business- or career-wise! Also in feng shui, the Lung-ta or wind horse is a powerful spiritual force invoked to change a person's unlucky destiny and enhance his luck. Banners, pictures, figurines, even key chains featuring the wind horse are used and displayed by many Asians to counter the unlucky winds or directions for the year. Expected to have the fewest good luck this year are those born in the year of the Rat and the Ox, and some say even a few Horse people will have to take a minor dose of unluckiness. But never fear! Feng shui experts advise carrying or using jade as an cure-all, preferably in the shape of your zodiac allies, to shield yourself from the aggressive winds of the year of the Horse! Once upon a time, the horse's abode was in the heavens. There was only one horse then, magnificent and radiant as he spread his giant silver wings to glide in the sky. He answered directly to the Jade Emperor, who sends him on important errands to earth, sea and sky. As can be expected of such creatures, the horse soon became proud and cruel. All the other animals shunned the horse because he mistreated them. 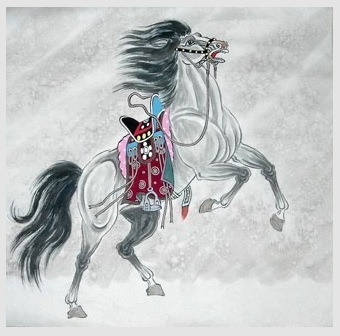 One day the Jade Emperor ordered the horse to take an important letter to the Dragon Ruler of the East sea. As the horse landed at the palace, a king's guard stopped him and demanded his business there. Affronted that he was not recognized, the horse grew mad and kicked the guard, who died instantly. The Emperor heard of what the horse did, and immediately ordered that the horse's wings be destroyed for his crime. He was also to be banished beneath a great mountain on earth, to remain in darkness forever. The horse was moaning for hundreds of years beneath the great mountain when someone passed by and heard his lament. Some say it was Pan Gu, others say it was one of the immortals, no one knows now for sure. When the horse sensed the magical presence of this being, he declared that if he was freed from his fate, he would spend his life in loyal service to mankind. Pan Gu (or maybe the immortal) took pity on him and freed the horse from under the mountain. The horse was very grateful and fulfilled his promised service to mankind. When the great zodiac race was announced, the men encouraged the horse to join, and all mankind prayed to the Jade Emperor to include the horse in the great wheel of destiny. Seeing how loved the horse was among the people, the Jade Emperor forgave the horse and placed him with the other noble animals in the eternal zodiac. Thus was established the year of the Horse. Pai Ma Ssu, or the White Horse Temple, is one of the earliest Buddhist temples established in China. It is located in Henan Province. In Buddhism, the white horse often mentioned in sacred texts is an everlasting symbol of purity and loyalty. China was also known for its ancient horse worship, mainly an ancestral horse turned into a god to whom many cult followers offered sacrifices. Asian countries including China also had a tradition of sacrificing horses to ensure success in battle, have a plentiful harvest, or preserve peaceful times. In the ancient days, Chinese horses were not directly ridden by their masters. They were harnessed to chariots of kings and noblemen. Horses were sacrificed and buried with rulers or kings who passed on to accompany them in their travels in the afterlife. In later times, beloved horses were also buried with their noble masters. The Qin dynasty horses are symbolic of the conquering fame of the 10 Manchu emperors, who are the admired horsemen from the North. Eight horses strung together refer to the magnificent horses of King Mu, who was supposed to have lived in the 1000 BCE. Scholars noted that the eight horses are also an allusion to the eight winds. Invoke the Horse for a more vibrant luck this 2014! Be more decisive, spirited and aggressive by remembering that the year of the Horse will spur on everyone in their most cherished quests! Esteemed Horse, give me Speed! Return from the year of the Horse to the homepage. The beautiful rice paper paintings on this page are done by Zhao Huo Gua and Lu Ye Guang of Ink Dance Chinese Paintings.